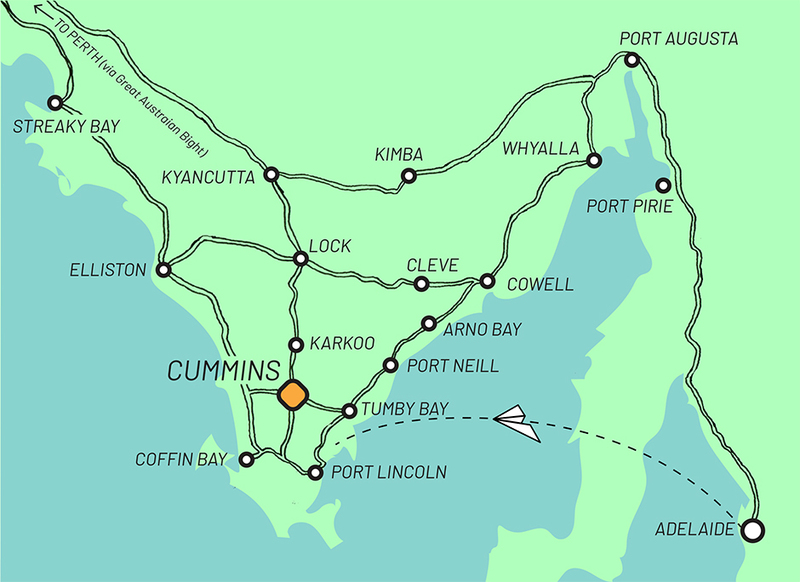 Cummins is located within the District Council of Lower Eyre Peninsula, a short 70km drive from the regional centre of Port Lincoln. 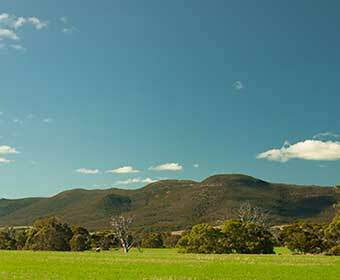 Whilst it is 640km, by road from Adelaide, it is a destination guaranteed to journey that extra mile. 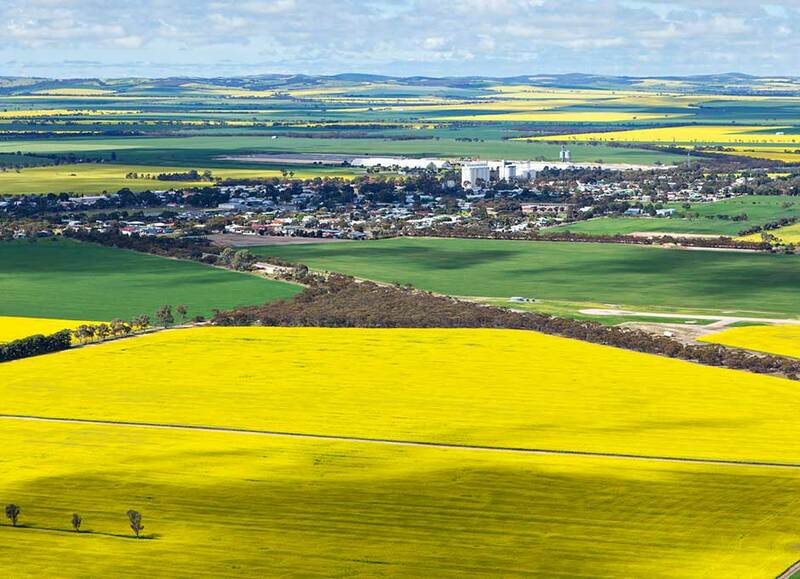 Developed to be the agricultural hub of Lower Eyre Peninsula, the 900-plus residents of Cummins rely on the farming industry to this day, with a substantial portion of the State’s wheat crops grown in the area, as well as livestock and other grain and legume crops. The town’s unique layout sees a dual railway cut through the centre of town – a constant reminder of what makes the wheels turn in the region. Cummins is the perfect place to base yourself to not only explore the local agriculture but also to travel a little further afield, and check out the multitude of beautiful beaches, salt lakes and rugged coastline. 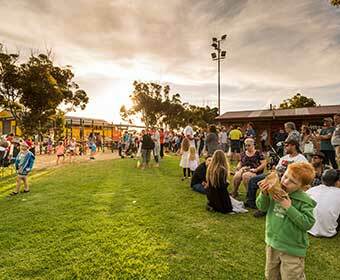 Offering a range of goods and services for travellers, from delicious food to comfortable accommodation, fuel and vehicle maintenance, camping supplies to recreation facilities, to health services and retail outlets; Cummins really is the place to sit back and relax on your next visit to the Lower Eyre Peninsula. The Cummins area is situated on the traditional lands of the Nauo and Barngarla people, who based permanent settlements around the abundant freshwater springs through the area, utilising the rich terrestrial resources of the land, and taking advantage of the plentiful seafood along the coast. 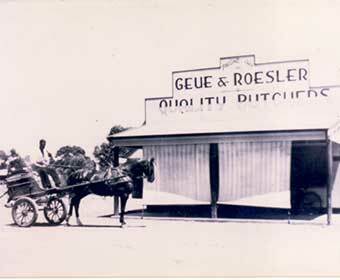 European settlement began after February 1904 when families were allocated sections that had initially been surveyed in 1902. The town is named after William Patrick Cummins who was a member of the South Australian Legislative Council from 1896 to 1907, when he died. The town grew steadily. The Town Hall was opened in May 1907, while the railway line from Port Lincoln to Cummins was completed in November 1907, just in time for harvest. With the railway now running through the centre of town, Cummins became the commercial hub of a rapidly expanding agricultural district; the silos were built in 1962, which saw the start of bulk handling taking over from the labour intensive process of grain being bagged and lumped into stacks. Today Cummins remains a busy farming town with communities from the surrounding district using it for essential services. Harvest time around the district is generally October to January which sees many trucks come through town delivering their produce to the silos and strategically planned bunker system, currently operated by Viterra Australia. The fertile soil surrounding Cummins and reliable rainfall has made it a food bowl for the State, with agriculture on the Eyre Peninsula being one of the leading industries in the region. In a good season, it can grow up to 50 per cent of South Australia’s wheat pool and 10 per cent of Australia’s. Visitors to the Cummins area around August to October will be greeted with bright yellow canola fields throughout the district as well as other crops such as barley, wheat and legumes. 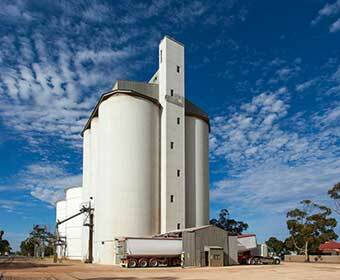 There are multiple Viterra grain silos located across the region such as at Yeelanna, Edillilie and Kapinnie, with a major grain receival site located in Cummins, which includes concrete silos and bunkers for storing grain with a total capacity of 470,000 tonnes. During the 2016-17 harvest, the site received a record-breaking 550,000 tonnes of grain. 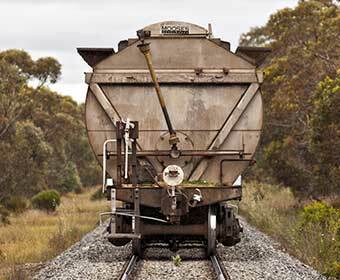 Cummins boasts the unique feature of two railway lines running side-by-side through the town which transport grain from the local silos to the port at Port Lincoln, where the majority of grain is taken for export. Making the most of the steady supply of grain in the district, the Cummins Mill is the only operating flour mill on the Eyre Peninsula. It produces a range of baking flour and stock and animal feed. The area is also home to beef cattle and sheep producers (for meat and wool). There are also several studs in the area which breed Merino and Suffolk stock. With tourism interest being shown in the agricultural industry, a small number of farming enterprises in the Cummins area are diversifying and beginning to open their farms to provide a tourist experience. See our farm to table page for more information. Geographically, Cummins is 273km from South Australia’s capital city Adelaide (as the bird flies), but by road it is approximately 640km. A number of short, 45 minute flights leave several times a day from Adelaide to nearby Port Lincoln with Regional Express (Rex) or Qantas airlines. Upon landing, hire cars are available from the Port Lincoln airport. The airport is located about a 10 minute drive north of Port Lincoln near the small town of North Shields. There are several ways to get to our region from the airport. Either head out to Flinders Highway towards Port Lincoln then onto the Tod Highway (approximately a 70km drive); or head north along the coast and turn off onto Bratten Way at Tumby Bay, for a scenic drive through the Tumby hills and past the picturesque Yallunda Flat (approximately a 80km drive). Sea SA also intermittently operates a ferry service from the Yorke Peninsula town of Wallaroo to the Eyre Peninsula town of Lucky Bay. Lucky Bay is 168km from Cummins. Please note that currently the ferry is out of service.